AP have produced a book entitled ‘A Printed Thing’ to commemorate their twenty-first anniversary. 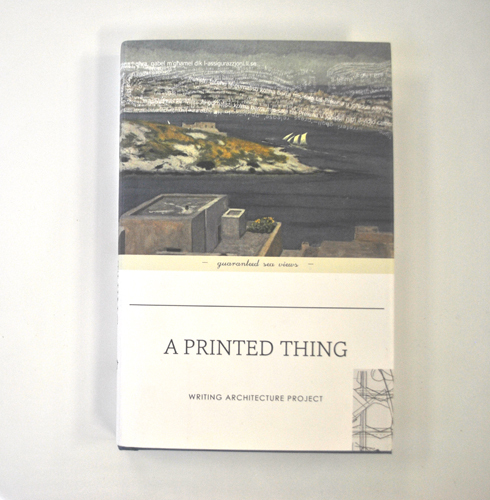 ‘A Printed Thing’ is the attempt of an architectural firm to express itself and to describe its vision without using conventional architects’ tools of communication such as plans, drawings and models etc. The book consists of a collection of essays by colleagues and friends of AP, whose work “wraps itself round the work of centuries”. The essays were collected spontaneously and independent of any specific theme chosen a priori. Although accompanied by illustrations ranging from conceptual drawings to installations, from antique maps to photography of AP’s built work, it is the words that become here the architects’ matchless ally, even if these words merely serve to support and describe the firm’s passion for architecture and creativity. The contributors, who include Hans Ibelings, Timothy Britain Catlin, Mark-Anthony Falzon, Pierre Mejlak and others, tackle varying facets of architecture, interior and space, tracing trajectories that are derived from their own specific discipline or vision, be it that of the architect, the critic, the educator, the artist, the writer or the anthropologist. In spite of the several points of view, but also because of them, the book evokes a common sense of architecture as a generator of real life, not only the backdrop to historical or routine events, but also a place-maker, a container of meaning, a catalyst for the creation of kinship, a social binder and a producer of narratives. The result is a book about Architecture that is permeated by a seductive quality emblematic of the island's particularly rich history, its Mediterranean climate and its enduring myths. It is a book about AP but also, and especially, a book about Malta. A Printed Thing is available from all leading bookstores across Malta and Gozo and can be purchased online.